Louisville, Kentucky – There were two enigmatic Bluegrass bands in Kentucky whose recordings, concerts, and band members have become part of the folkloric history of the state and major forces within the music industry; The Bluegrass Alliance and the Newgrass Revival. Indeed a history full of yarns, tall tales, hijinks, strife, highs and lows, with a cast of characters that made Kentucky the center of the Bluegrass universe during the 1970s. These two bands were instrumental in changing the course of Bluegrass music forever. 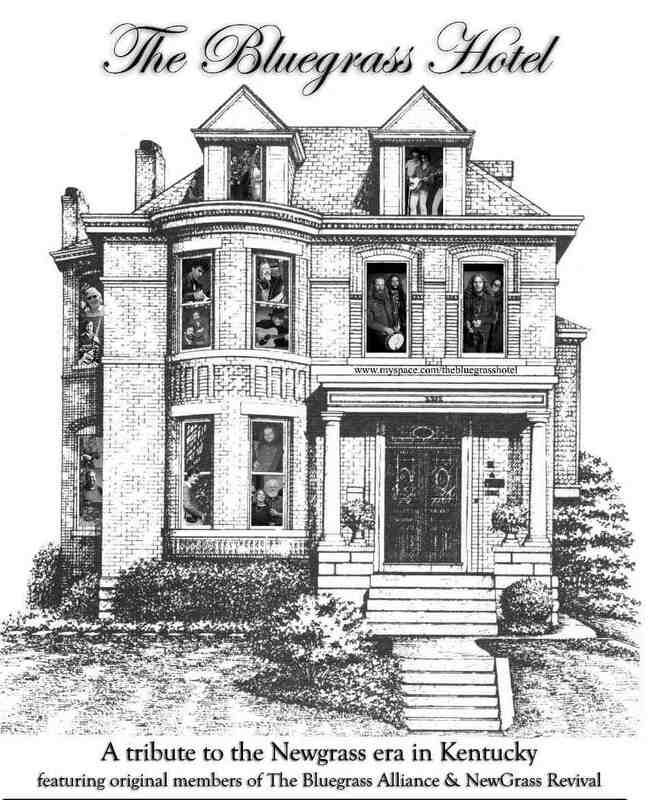 Another key component of the Bluegrass scene in Kentucky and a unifying part of the narrative during those halcyon days of the 70s, was the old Victorian mansion in Cherokee Park near downtown Louisville. The infamous Bluegrass Hotel, whose proprietor Harry Bickel and Harry Sparks – luthier of renown – made life more stable and pleasant for its residents and super pickers that included Dan Crary, Tony Rice, Vince Gill, Jerry Douglas, J.D. Crowe, Ricky Skaggs, Tony Williamson and many others who were making their way though the treacherous waters of the music business. The Bluegrass Hotel was Louisville, Kentucky’s equivalent of the Buena Vista Social Club in Havana, Cuba (the award winning film by Ry Cooder); a music breeding ground, half-way house, and scene of stellar all-night jam sessions, world class pickers and vintage instruments galore, reflected Fred Bartenstein, Bluegrass music historian and consultant to the project. If it wasn’t for The Bluegrass Hotel, I don’t know how a lot of young Bluegrass musicians could have moved to a different city to learn how to play music, said Sam Bush, former member of The Bluegrass Alliance, founder of New Grass Revival and Bluegrass Hotel perennial. It was like that old song, The door is always open, said Bush. You were always free to stop by. As the recognized Father of Newgrass, Sam Bush was the engineer driving the Newgrass train. As Newgrass turns 40 in 2009, alumni of both bands have launched am ambitious year long project celebrating the New Grass era in Louisville, Kentucky, titled The Bluegrass Hotel. The centerpiece of the project will entail a documentary film, which includes a 2009 live concert with the alumni and special guests, reality based footage of storytelling, vintage instruments, jam sessions filmed at the legendary Bluegrass Hotel, and archival performances of The Bluegrass Alliance and Newgrass Revival during the 1970s. A Book, DVD and CD will be launched in conjunction with the broadcast of film, anticipated for the Fall of 2009. Proceeds of the DVD and CD will benefit the Foundation for Bluegrass Music educational initiatives. There is very little documentation about this era, said guitarist and Bluegrass Alliance co-founder Dan Crary. We are happy to announce the Launch of this very significant and important project during the 2008 IBMA World of Bluegrass conference in Nashville later this month. Immediately following the announcement will be a private pre-screening of Dan Crary’s film “Primal Twang – the Legacy of the Guitar”, a work in progress. There will also be raffle/prize drawing for a Taylor Guitar.